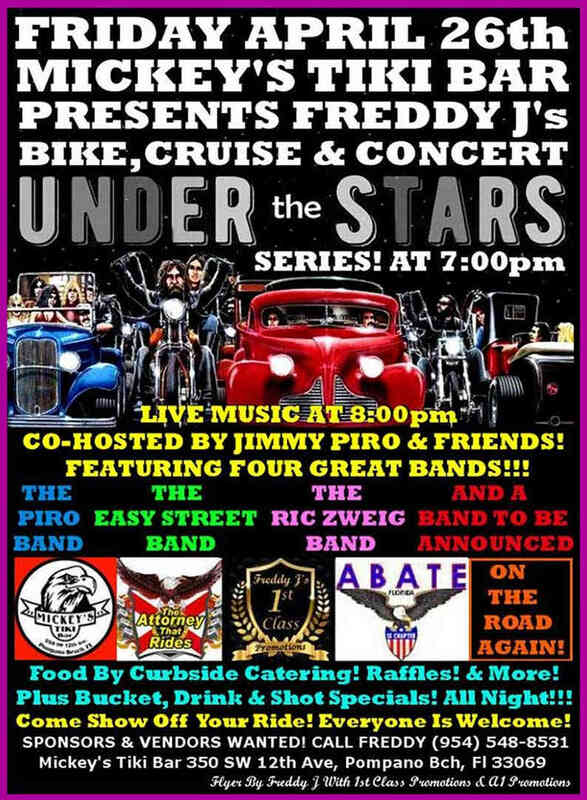 Mickey’s Tiki Bar Presents Freddy J’s Bike, Cruise & Concert Under The Stars Series! At 7:00pm. LIVE Music At 8:00pm. C0-Hosted By Jimmy Piro & Friends! FEATURING Four Great Bands!!! The Piro Band, The Easy Street Band, The Ric Zweig Band & A Band To Be Announced!!! Food By Curbside Catering! Raffles! & More! Plus Bucket, Drink & Shot Specials! All Night!!! Come Show Off Your Ride!